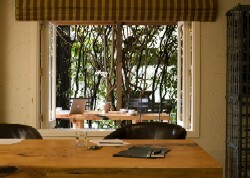 The secluded environment at Vin Alto, guarantees total privacy and provides the perfect setting for a meeting, think tank or planning session. 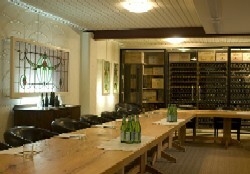 Our dedicated meeting space, the Cellar Room, is quiet, comfortably furnished and well equipped. 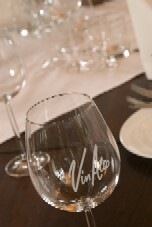 Adjacent to Vin Alto's impressive wine collection, the room has a warm, business-friendly ambience, conducive to getting great work done! Guests can also enjoy a little taste of Vin Alto's Italy with morning and afternoon teas, lunches and dinners served in our courtyard or Enoteca restaurant. For enquiries or bookings, please phone 09 292 8845 or enquire online. The concept of an Enoteca dates back to Roman times when it was simply a country wine bar where local wines could be drunk and purchased. Also available were small plates of regional food or fresh produce from the farm prepared in the Enoteca kitchen by the family or wife of the host, very often using old family recipes and methods. The wine always remained at centre stage however, and the food was there to make them shine.